As you may have heard, central Texas has recently been under siege by many horrific wildfires in the last couple of weeks. Right now, in the Bastrop area, thousands of people have lost their homes and over 35,000 acres continue to burn. Well what does any of that have to do with Twilight? Our very own Charlie Bewley, better known to those on twitter as @alchemission, has been down in Bastrop at the local Home Depot, helping the Red Cross out. Charlie has been streaming the Red Cross efforts live over twitter, and sharingwith people what they can do to help. 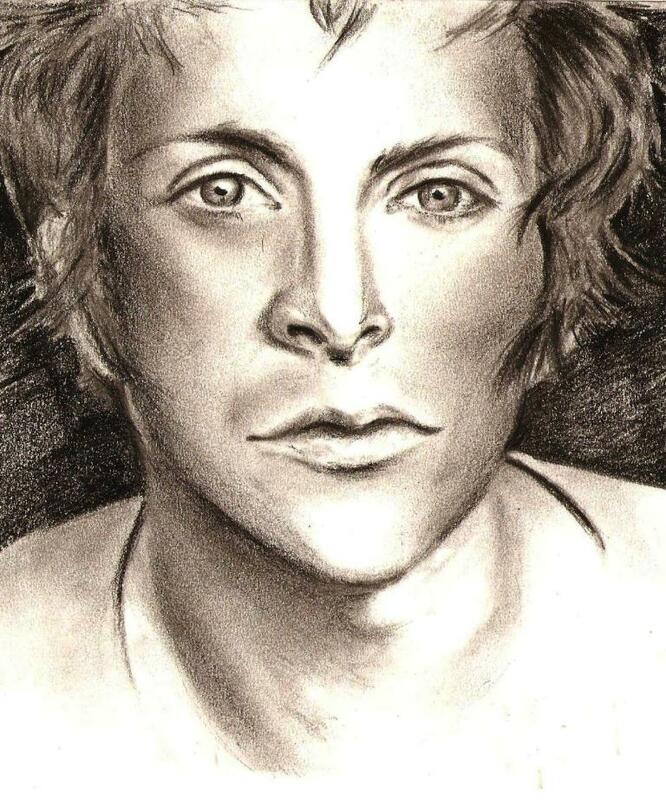 You can also follow Charlie’s livestream on twitter here, you can follow Charlie Bewley on twitterhere, and follow the Central Texas Red Cross here. Kudos to you Charlie, this area needs all the love and support it can get. You can find out how to donate to the Red Cross on their official page here. Here’s a new look at Felicity Jones as Anna and Anton Yelchin as Jacob in LIKE CRAZY, from Paramount Vantage and Indian Paintbrush. The movie also features Jennifer Lawrence, Charlie Bewley, Alex Kingston, Oliver Muirhead, Chris Messina, Finola Hughes, Ben York Jones, & Jamie Thomas King. LIKE CRAZY won the Grand Jury Prize for Best Picture and Special Jury Prize for Best Actress at the 2011 Sundance Film Festival. or downright love LIKE CRAZY? 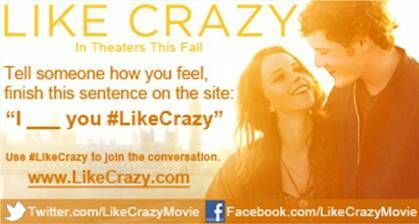 Join the conversation and let them know with our #LikeCrazy Twitter Feature! Visit the Official Site HERE to see what everyone’s saying! A love story is both a physical and emotional tale, one that can be deeply personal and heartbreaking for an audience to experience. Director Drake Doremus’ film LIKE CRAZYbeautifully illustrates how your first real love is as thrilling and blissful as it is devastating. 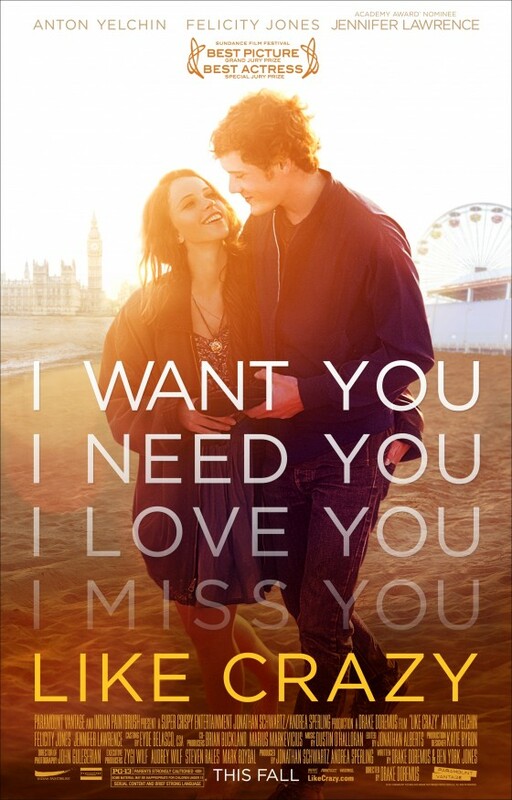 When a British college student (Felicity Jones) falls for her American classmate (Anton Yelchin) they embark on a passionate and life-changing journey only to be separated when she violates the terms of her visa. Like Crazy explores how a couple faces the real challenges of being together and of being apart. Winner of the Grand Jury Prize for Best Picture at the 2011 Sundance Film Festival and of the Special Jury Prize for Best Actress for Felicity Jones, Like Crazy depicts both the hopefulness and the heartbreak of love. Produced by Jonathan Schwartz & Andrea Sperling, written by Drake Doremus & Ben York Jones, and directed by Drake Doremus, LIKE CRAZY will be in theaters October 28, 2011 (limited release). Rated PG-13 for sexual content and brief strong language. We’ve learned about menu suggestions and upcoming celebrity appearances that are taking place right at this local theater. We spoke to Angelique Barthel, Hollywood Blvd.‘s marketing and public relations go-to gal. She explained how the theatre got started and gave us even more reasons why we should give the concept of eating and drinking during a movie a try. Patch: How did Hollywood Blvd. begin? Barthel: In 1991, Hollywood Bar & Filmworks opened in Indianapolis, Ind. CEO Ted Bulthaup was the first in the country to integrate full bar and dinner service with first-run movie exhibition. Patch: The theatre is decorated in such a colorful way. Who designed it? Barthel: Ted is the creative force behind the theater’s unique decor and the theatre’s extensive collection of authentic Hollywood memorabilia. On display in our museum space includes pieces from The Grinch, Austin Powers, Dreamgirls, Gone With the Wind, It’s a Wonderful Life, The Wizard of Oz, and much more. Patch: What kind of experience do you hope every guest has? Barthel: The ultimate movie going experience — great value, a unique experience and delicious food and drinks. Offering guests the chance to meet a favorite celebrity or see a screen-used prop just makes it more fun! Barthel recommends coming 30 to 45 minutes before your scheduled showtime to ensure the best selection of seats. Patch: What are some of the special events you have coming up? Barthel: A star studded lineup Sept 30, Oct. 1 and 2, including Jan Michael Vincent, James Darren, Penny Marshall, Cindy Williams and Henry Winkler. Oct 1st only, you can meet Barry Bostwick and Patricia Quinn from The Rocky Horror Picture Show. On Oct. 28-31, meet Linda Blair with big-screen showings of The Exorcist. Nov. 18-21, meet two stars from the Twilight series. The first guest announced first to Facebook fans is Daniel Cudmore — Volturi vampire Felix. Patch: If someone was coming to the theatre for the first time, what one drink and one food item would you recommend? Barthel: My favorite is the hand-tossed garlic butter brushed crust pizzas — whether you like plain cheese or are a carnivore. Jurassic Pizza has four different meats. The pizza is a must-try. Favorite drink is almond martini and Lewis classic martini (only $5 on Thursdays).